languagehat.com : A LATIN QUESTION. But the Wikipedia article says “Although the commonly used form of this quotation has ferentēs (with a long ē), the original text has ferentīs (with a long ī),” and sure enough, my Oxford Classical Texts edition has ferentis, with no alternate form mentioned in the notes. So I have two questions: How does ferentis work grammatically, and what is the history of the universal misquotation (assuming that’s what it is)? As I have often had occasion to say, I am no Latinist; I can pick my way through a text thanks to Brother Auger’s stern methods of instruction back in seventh grade, but the finer points of syntax are lost on me, so (Google having failed me) I turn to the learning of the Varied Reader. There is no functional difference between these forms; they are alternates of the same thing (accusative plural in this case), with the proviso that -is (long i) is generally reserved for poetry. The change arises when a scribe normalizes a text, substituting a more common form for a less common one. This should be the active participle, but I can’t find the form ferentīs in my Wheelock: it’s either ferentes (with a long e) – in plural Nom./Acc., or ferentis (with a short i) in single Gen). Perhaps, the other form is an older one, no longer used? This ain’t no dative, though. The participle is 3rd decl; the dative would have to end in -ibus. Ferentis (long i) modifies Danaos. -is is the older form, -es a newer variant. I-stem endings in Latin tended to give way to consonant-stem endings as the language evolved. Both endings are correct. Evidence from ancient commentators and good manuscripts indicates that Virgil wrote in a more conservative language, and would have used the older form. Later generations would quote him using their own form of the language, much as we might quote Shakespeare from memory using more current language. Jim has it right. To flesh it out a little more, present participles are declined as third declension i-stems. Their accusative plural should end in -īs but by the time of Augustus the consonantal -ēs form was taking over except it took longer in poetry. Aw, shucks, too late to the party to show off my Latin. Yeah. It’s just the earlier form of the accusative. “I fear Greeks, even gift-carrying ones!” The dative-looking-ness is a red herring. Thanks, all! I am now a bit more educated than I was a few hours ago. I didn’t bother reading the subsequent posts, but the reason is that it’s one of these old i-stem accusative plurals. I-stems are on their way out in Latin, but vestigia of them occasionally come out in the the 3rd declension where they would be expected historically. No Latin grammar in English will tell you this properly though. (Typical). Hey, what happened to Memiyawanzi? Apologies if that last post was a little brusque, I just got back from having dinner and drinks with philologists after a wonderful evening seminar on South Picene and can’t be bothered to think too hard right now. I always thought the line should read “Beware of gifts bearing Greeks”. @David Derbes: et is another old form. It meant dven before it came to mean and. Nowadays it could be simply “Beware of gifting Greeks”. Nothing to do with Latin, I’m afraid, but it no longer appears possible to add comments to the Chavacano thread. Has something been changed on the server, or is it just my browsers (I’ve tried more than one) that are not working properly? In Portuguese the idiom “a Greek gift” is widespread, meaning of course a gift with hidden intentions or otherwise unwelcome. I wouldn’t say that the word auch here by itself “has a meaning”, i.e. something that could be fitted into any context and impart the same flavor. “auch nichts” is like dried hominy – it acquires significance only when it is reconstituted in certain ways. I mention dried hominy because my sis just sent me some. There must be a more familiar way to explain how “auch nichts” works, but I don’t know it. Hominy not the same as homily, then. Athel: I think threads are closed after some time to ward off spammers. I would say “auch” means basically the same thing there as it does elsewhere (also/even). If you keep in mind that German generally negates the object while English tends to negate the verb, it doesn’t sounds so odd to me. “Haven’t you forgotten even *something*” or “anything at all?” . We just express that idea differently. He must be a hell of a clever schoolboy to translate Virgil so perfectly. Invite him to this blog at once, please; we could use some newwwwwwwwwww bloooooooooooooooood. ‘Hic ibat,’ as I told you before, ‘Simois,’ I am Lucentio, ‘hic est,’ son unto Vincentio of Pisa, ‘Sigeia tellus,’ disguised thus to get your love; ‘Hic steterat,’ and that Lucentio that comes a-wooing, ‘Priami,’ is my man Tranio, ‘regia,’ bearing my port, ‘celsa senis,’ that we might beguile the old pantaloon. Now let me see if I can conster it: “Hic ibat Simois,” I know you not, “hic est Sigeia tellus,” I trust you not; “Hic steterat Priami,” take heed he hear us not, “regia,” presume not, “celsa senis,” despair not. Note the error in gender, hic est instead of haec est: tellus looks masculine, but it’s a 3rd-declension feminine with genitive telluris. Ovid also has ablative hac, not predicate nominative hic, since ibat is not a copulative verb. Rodger C., John Cowan: I am reminded of Rumgudgeon in Edgar Allan Poe’s fine short story “Three Sundays in a week”, who translated POETA NASCITUR NON FIT as “A nasty poet for nothing fit”. And then there is Quod licet Iovi non licet bovi, which means ‘he who likes Bon Jovi does not like David Bowie’. @John Cowan: Hic ibat Simois; hic est Sigeia tellus, though a misquotation, isn’t ungrammatical: Lucentio must have been taking hic as the adverb meaning ‘here’, not the demonstrative pronoun. Nothing to do with Latin, I’m afraid, but it no longer appears possible to add comments to the Chavacano thread. What Leonardo said: I close them up when real comments stop appearing and spammers take over. Do you want me to reopen it for you? Jeremy: “Haven’t you forgotten even *something*” or “anything at all?”. We just express that idea differently. I take your point, and have just identified the reason why I felt that the sequence of words auch nichts functions differently in different sentences. It depends on which word is stressed. The auch in B’s statement refers to ich, not nichts: that is, “I don’t have anything either“. “Auch ich habe nichts” is perfectly correct, but in everyday conversation (depending on the audience, of course) would seem slightly stilted – just as “I too don’t have anything” would in English. The consensus in this thread seems to be that the Latin phrase would have had slightly different connotations over the centuries. Long ago, English “and” used to have the sense of “if” (in addition to “and” ? ), as in “And it please you …”. What are the semantic relationships between the older concessive/conditional uses of “and” in English (if, even, though, particularly) and the “as well” use (which, as I write it, seems strange – “well” ?)? Same question about the Latin “et”. I speculate wildly: since speech is linear, speaking is always a matter of “one damn thing after another”, i.e. a1 AND a2 AND a3. Even cavemen must have found this unsatisfactory, when (for instance) a1 had a particular relationship to a2. So “I am moving to a different cave and you stink” morphed into “I am moving to a different cave and-because you stink”. Concessive “and” could have originated similarly. In “Timeo Danaos et dona ferentes”, “et” after a verb phrase but followed by a noun phrase became a convention for “and-though”. This speculation would imply that the invention of “or” must have really blown people’s minds. Coping with “or” requires you to rise farther above the linearity of speech than is required by “and”, and to use your speech memory in an unusual way. Hard on the heels of “or”, after comparison with “and”, comes the idea of causality. How is this related to conditional “an,” as in “If ifs and ans were pots and pans we’d have no need of tinkers”? Do you know that in “Asterix the Legionary” Goscinny wrote this Latin tag? Although I was a child when I read it so I didn’t understand I laughed because its use is absurd in this case. Grumbly, I think Latin et probably developed from ‘also, even’ to ‘and’ (a kind of grammaticalization? ), rather than the other way around. (The Greek eti ‘yet, still’ is cognate, I think.) Lots of languages have no word for ‘and’ at all, surprisingly enough. Well, at least they don’t have to worry about whether you’re allowed to begin a sentence with it, then. Now we can argue about Et in Arcadia ego. The development of the Scandinavian conjunctions og “and”, enn “than” and men “but” is rather interesting, but I don’t know enough about it to say anything substantial. Not that I won’t say anything. Og has still a life as a mainly sentence-final adverb meaning “too”: Det mener jeg òg. This is competing with the compound også. Enn is also used adverbially with vestiges of old meaning. In literary register it’s used to introduce a counterfactual option: Og tok de enn vårt liv “And would they rather take our lives” — a book about Norwegians in German KZ camps. In this meaning it competes with the compound enda. To provide for any outcome: Hva som enn skjer. “Whatever happens”. It can have a wider use is dialects. Meire enn “Even more”. In Trøndelag it can be an expressive: e.g. Einn det! “Would you believe it!”. Or introduce a new theme: Einn i morra, ka ska du da? “But tomorrow, what are you doing then?”. Oops, part of my OED quote got eaten up, and now I can’t reconnect to their website. Sorry if anyone was left in suspense about the unlikely Scandinavian influence. I just checked the German and English WiPe articles on that. It is not classical Latin at all, but an art history artefact that art historians tussle over. The German article includes a long, learnèd disquisition on why Poussin can be considered a Baroque painter. 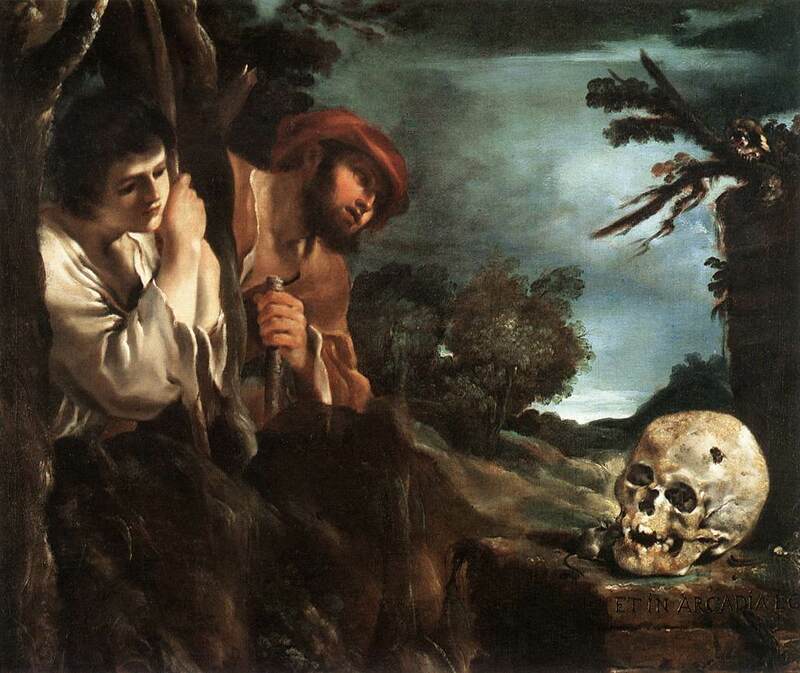 The expression first appears as an inscription in an early 17C painting by “Guercino” (see the WiPe for links). The inscription is barely visible beneath the skull at the lower right in this (dark ?) reproduction of the (dirty ?) painting. The discord concerns the question of whether “et” refers to “Arcadia” or “ego” – similar to the two examples of “auch nichts” that I gave above, where auch refers to nichts in one case and to ich in the other. While the phrase “et in arcadia ego” is a nominal phrase with no finite verb, it is a well-formed construction because substantive and copular verb omission is perfectly acceptable in Latin. Pseudohistorians unaware of that aspect of Latin grammar have concluded that the sentence is incomplete, missing a verb, and have speculated that it represents some esoteric message concealed in a (possibly anagrammatic) code. In The Holy Blood and the Holy Grail, Baigent, Leigh, and Lincoln, under the false impression that “et in arcadia ego” was not a proper Latin sentence, proposed that it is an anagram for I! Tego arcana dei, which translates to “Begone! I keep God’s secrets”, suggesting that the tomb contains the remains of Jesus or another important Biblical figure. The German article is aloof about the pseudo-linguistics, and takes up the cudgel for the art-historical interpretation of Brandt und Becht-Jördens/Wehmeier as opposed to that of Panovsky. It’s amusing how one tussle leads to another. Trond: Og has still a life as a mainly sentence-final adverb meaning “too”: Det mener jeg òg. This is competing with the compound også. Like das meine ich auch, I suppose. But what is the “competition”, what is også ? On the discussion page of the German article, “Janneman” contributed another anagram: “Nacedei a tergo? I!” German speakers will read this as Nackedei a tergo, meaning “[someone in his] birthday-suit taken from behind ? Yuck !”. Here’s the OED paragraph in full (gotta watch for those < marks and turn them into the four characters “& l t ;”, not only when typing but when pasting too). Branch A. II. (the conditional use) probably represents a native semantic development from the use as coordinating conjunction, although the details are unclear. Scandinavian influence has sometimes been suggested, but is unlikely: although similar uses in the senses ‘if’ and ‘even if’ are attested for Old Icelandic enda ‘and indeed, and moreover, and yet, although, if, even if’ (probably < the Germanic base of and conj., adv., and n.1 + the Germanic base of though adv. and conj.) as well as for the cognate Old Icelandic en, enn, early quots. for the conditional use do not come from areas with close contact between English and Scandinavian languages. Middle High German unde, unt has also been compared to the English conditional use, but although it does occur introducing conditional clauses, its precise meaning and function in such instances are hard to pin down, so much so that it has been suggested that it may lack any tangible lexical meaning and merely serve to emphasize the beginning of a subordinate clause (see H. Paul et al. Mittelhochdeutsche Grammatik (ed. 24, 1998 ) §445). In later use, the conditional use is usually treated as a distinct word and spelt an (see an conj. and discussion at that entry). This is the only interpretation that has ever made sense to me; the others all seem to me to be straining at imagined ambiguity. But, as I say, I am not a Latinist. Yes, close in meaning, but etymologically a compound of og and så — “auchso”. It can even compete with og as a conjunction: Jeg også Per skal på kino. This is perceived as children’s language, but I think it’s justified and ancient: Jeg, og så Per, skal … “I, and then Peter, will …”. What’s harder to defend by etymology, but perfectly understandable, is the conflation with the infinitive marker å. Og and å are famously homonyms in most dialects, and in the heads of most speakers the same word (as is easily confirmed by listening to politicians pronouncing the g of og for emphasis even in å). Since også is perceived as a variant form of og, we get outcomes like Det må jeg prøve også få til. etymologically a compound of og and så — “auchso”. Functionally sorta like the German sowie = “as well as”, except this occurs only in formal, not children’s language. I don’t think it has anything much to do with the Latin. It’s an attempt to make sense of the allusive fragment “Also I in Arcadia”. Who’s speaking, and what is meant by “Arcadia” here, and does also attach to I or to Arcadia? And more complex than these, what does the implied copula actually mean? An American diner trying to assist a mentally overburdened waiter may helpfully say I’m the veal cutlet without anyone supposing a transmigration has occurred, and in Chinese this use of the copula is frequent: Tā yě shi yíge Měiguó zhàngfù ‘She also is [an instance of someone married to] an American husband’ (Ramsey, The Languages of China). No, answer these questions how you like, whether you know Latin or not: I daresay much more farfetched interpretations are possible. In a good dictionary of Latin tags I have, it’s translated as: “I also have been in Arcadia”. He may also have been in the Penny Arcadia. I am afraid that once again my only previous knowledge of the quotation is indirectly through Bertie Wooster. Thanks for recovering my amputated quotation, John. On Arcadia, I’ve always assumed (like Hat) that the first of your three readings is what’s intended. I think the other two are ruled out, the second because Arcadia isn’t a Heavenly Paradise (and is presumably the scene of the painting, going by the shepherds), the third because the implied tense of a verbless sentence in IE languages is always present, not past. I think. Yep, deliberate archaism. Was actually explained in my schoolbooks. …and the superlative Augustus (a superlative so super only Hermes Trismegistos can top it). Huh. Interesting. Modern German und is about as exclusive in meaning “and” as I can imagine, except in older poetry where it may be influenced by Latin*. OK, it translates both i (pure “and”) and a (more towards “but/while/whereas”: “this is A, and that is B”) of Slavic languages, but that’s it. * Luther: Und wenn die Welt voll Teufel wär “even if the world were full of devils”. Agreed – especially because the use of ego instead of sum is strong emphasis. Today: Und wenn schon ! = “so what !” = “even if that were true, it doesn’t make any difference”. I remember from working in Hamburg the phrase Wenn schon, denn schon; most architects believe this to be the correct creative way to design buildings (rational or logical, but a bit naughty!!). Wenn schon, denn schon = Hebrew im kvar, az kvar, literally ‘if already, then already’, meaning the same as Grumbly’s gloss above. The Hebrew phrase must be a calque of the German; I’d always wondered about its origin. I think I get “und wenn schon”, but I can’t tell what “wenn schon, denn schon” means. Is it basically the same? Do the architects of Hamburg design buildings on a “so what?” basis? empty: I can’t tell what “wenn schon, denn schon” means. Is it basically the same? “Be consequent!” is an equivalent, although it’s more prissy than the original. Is the stress on the schon? WennSCHON, dennSCHON? Stu, I assume that the use of ‘already’ that is “known to us goys from TV comedy, as in ‘so do it areddy ! '” came about like this: Speakers of Yiddish learning English in the US got the almost entirely correct idea that “already” is how you say “schon”. I suppose that “alright already”, and maybe “enough already”, are part of the same story. Or do they go back further? No, the stress is on the WENN & DENN, like in atTENtion. I suppose it emphasizes the difference between the two words. Now, “I too am in Arcadio” is a much clearer remark, if a bit spintrian. That is exactly why people shouldn’t name their children after foreign capitals. Good point: Look what happened when Priam and Hecuba named their kid Paris. I’d like the translation from English into Latin of the phrase: I can’t be bothered! I’ve been to quite a few places but they seem intent for me to learn Spanish, Chinese, or some other language & all I wanted was the translation, Thanks to anyone who can help. I’d guess “operam non do,” but I am the worst Latinist ever. Maybe someone who actually knows Latin will help.